Mark your calendar for Sept. 28-29, 2019 for our celebration open house and worship. 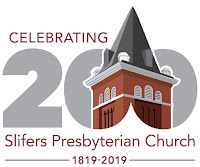 We are joyfully celebrating 200 years of praise and worship and want to include everyone who is part of Slifers history. If you or your family and friends are not in our current directory, please share your current address with us, so you can get an invitation to our 2019 celebration. Send addresses to SlifersPresbyterian@yahoo.com. 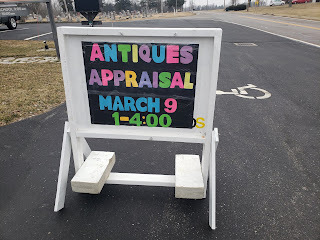 We had a great turnout and enjoyable afternoon at the Antique Appraisal. About 130 items were appraised by Smith Auctioneers who donated their time. We appreciate the volunteers who made this possible. 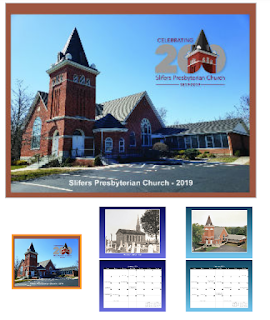 Celebrate our 200th anniversary every day with a 2019 Sifers calendar full of rich images of our people, our church and our history. Our initial order is SOLD OUT, but you can still order calendars online. Slifers Presbyterian Church - Where God’s people love… and it shows. A member of the Presbyterian Church (U.S.A.), Slifers features a friendly congregation of faithful people from all walks of life who serve Christ together in mission. 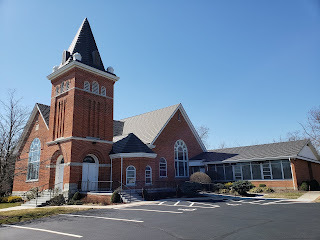 Located on the corner of Clayton and Chicken Bristle roads in Farmersville, Ohio, Slifers features a newly refurbished sanctuary hallowed by 100 year-old stained glass windows. You'll find Slifers people at church on Sundays at 10 a.m. but also in the community volunteering and making music together on Wednesday evenings. Join us. His Hands. We will use our hands to pray, help and heal. His FEET. We will use our feet to carry forth the Good News. His HEART. We will show compassion and love to one and all.